This week’s events are “big”: El Reno cooks up a huge burger, Science Museum Oklahoma celebrates the vast expanse of the universe, the American Organ Institute showcases a gigantic pipe organ, and the Oklahoma Choral Artists honor a big name in classical music. 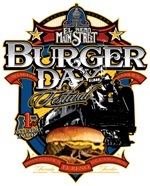 Main Street in El Reno turns into a huge block party for a day for the 24th Annual Fried Onion Burger Day Festival. However, the day is about more than a giant burger cooked and served to the entire community. Over 200 cars are anticipated to participate in the Burger Day car show, and two stages provide entertainment throughout the day. The Children’s Stage hosts performances by young musicians, mixed martial arts demonstrations, hula hoop contests and more. Prominent local bands such as O’Fidelis and Deer People take the Main Stage. Festivities begin at 10:00 a.m. this Saturday. Science Museum Oklahoma in Oklahoma City devotes two days to stellar exploration during “Space Days 2012” on May 4th and 5th. Oklahoman and NASA Astronaut John Herrington gives two presentations in the Science Live Auditorium both days. He flew as a shuttle astronaut on the STS-113 Endeavour and has logged over 330 hours in space. The museum also hosts hands on experiments, demonstrations, and rocket launches, as well as the special launching of the “Project OTTO” Weather Balloon on Friday at 10:00 a.m. with hopes of using attached cameras to capture footage of the balloon’s journey. Organs range in size and complexity from small electronic organs to massive pipe organs that fill up entire rooms. The American Organ Institute provides guests the opportunity to see the interworking of a pipe organ at its shop in Norman during the Fourth Annual Open House on May 6th from 3:00 to 5:00 p.m. During a tour, participants see components from the restoration of a 6,000 pipe Moller Opus 5819 organ used at the University of Oklahoma. OU purchased the organ in late 2006 for placement in the Sharp Concert Hall of the Catlett Music Center. When people think of iconic classical composers, Beethoven is one of the first names to come to mind. But who did he admire? Italian composer Luigi Cherubini is known for his operas and sacred works, and was considered by Beethoven as “the greatest of his contemporaries.” The Oklahoma Choral Artists perform Cherubini’s “Requiem” accompanied by a professional orchestra the evening of May 6th at the Cathedral of Our Lady of Perpetual Help in Oklahoma City. He wrote the piece in memory of King Louis XVI after his beheading during the French Revolution. The concert is open to the public. Destination Claremore continues through May 5th throughout the community. The musical “FLIPSIDE: The Patti Page Story” premiers at the Robson Performing Arts Center this Thursday at 4:00 p.m. with an additional performance on Friday. The Lilac Festival and Taste of Claremore also happen this week. For more events around your area, log on to our calendar page.